Karma is one of the most misunderstood topics in Eastern Philosophy and yet it is essential to understand if one seeks the true nature of reality. We see things, the world and those around us, as if they are there independently. This is opposite the truth. The law of cause and effect, karma, helps to understand and unravel our misperceptions of the world. Having a long-held interest in the mind's capacity for transformation, Ven. Gyalten Palmo left home to spend 4½ months in India with an enlightened master in the late 1970's. Ven. Palmo started studying Tibetan Buddhism at the turn of the century. 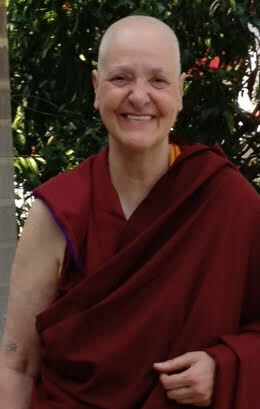 She has studied closely under Ribur Rinpoche, Choden Rinpoche, Geshe Ngawang Dakpa and Lama Zopa Rinpoche. She went on to complete the Foundation for the Preservation of the Mahayana Tradition's (FPMT) Basic Program coursework and retreats. In 2012, she was ordained by Choden Rinpoche at Sera Jey Monastic University in India. As an FPMT-registered teacher, she has been teaching Discovering Buddhism regularly at Tse Chen Ling Center in San Francisco since 2013. Ven. Palmo loves studying and sharing the Dharma with others. ﻿Our ability to continue offering these teachings is dependent on the generosity of donors. If you find this online content useful and you are not already attending the teachings in person, any donation would be greatly appreciated. Thank you for your kind support. Registration at the Door: $15 per class or $75 for the entire course (six classes) if paid in full on the first day of class. Members of a certain level get courses for free (see the membership program for details).